Most Minnesotans love nothing more than a cabin getaway, during summer or winter. Two houses on the 2018 Homes by Architects tour bring the cabin home to the owners, all year round. Fond memories of time spent at the family lake cottage drove the design of Home 6 on Minnetonka Bay. The home takes full advantage of the beautiful setting and has all the amenities of your favorite lake home, from a pool and hot tub to a fire pit, and a screened porch to extend enjoyment beyond the golden days of summer. 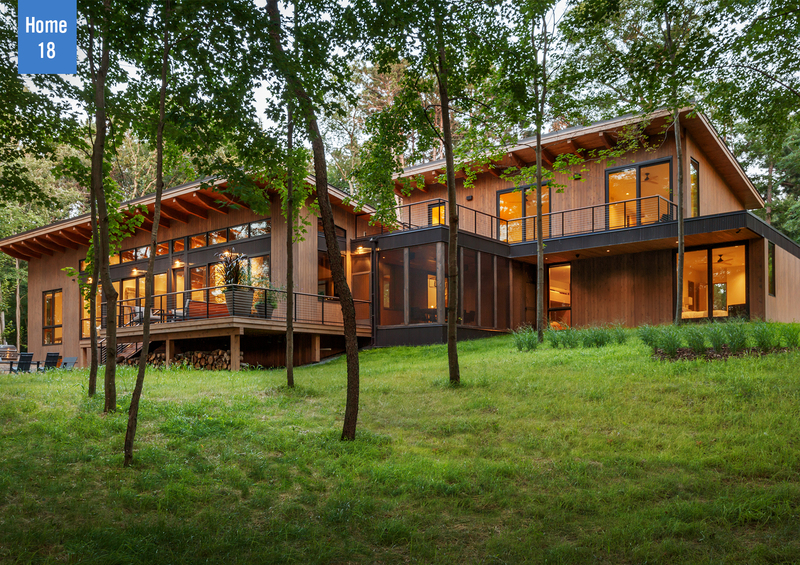 Five couples designed one legacy family cabin in Stillwater to create memories to last for generations. Home 18 in Stillwater features four master suites in two wings, inspired by the grand cabins of the west, with all the modern comforts and recreation spaces to make it a comfortable home year-round. Tickets to the 11th annual Homes by Architects Tour are on sale now. Learn more at homesbyarchitects.org. The 2018 Tour is supported by Marvin Windows & Doors, White Oaks Savanna, Carousel Motor Group, Elevation Homes, Streeter & Associates, Braden Construction, Brooke Voss Interior Design, Cambek, Kolbe Gallery Twin Cities, Mercury Mosaics, Ortal, Twin City Fireplace & Stone Co., Stinson Builders, Braaten Creative Woods, Denali Custom Homes, Frost Cabinets, HabAdapt Landscape Design, Hage Homes, Martha Dayton Design, Martha O’Hara Interiors, Modern Design Cabinetry, Muska Lighting, Norton Homes, Redpath Constable Interior Design, Rubble Tile, Showcase Renovations, Synergy Products, Urban Ecosystems, Bunkers & Associates, Bespoke Doorworks, Studio M Interiors, TS Building Supply, Garage Floor Coating of Minnesota, Mattson Macdonald Young, Partners Woodcraft, and media partner Greenspring Media.